“Oh, East is East, and West is West, and never shall the twain meet.” It’s been over a hundred years since Rudyard Kipling penned these words, but it is unlikely he would write those words today. I realized this when I had an opportunity to work alongside students from some of the best MBA schools in the country. Even though we differed in terms of our background and experience, we realized we were ever more closer to a global culture. 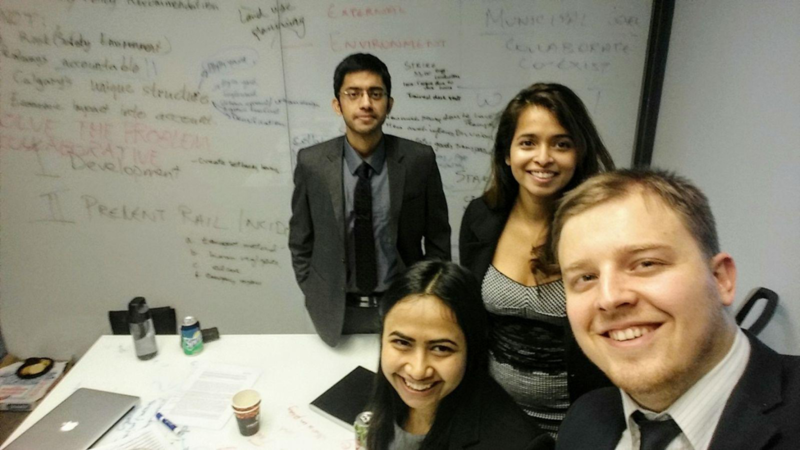 A team of MBA students– Alex Novikov, Anipa Jeyakumar, Siddhartha Gupta and Yashu Mittal were chosen to represent SFU at the East Meets West Leadership Case Competition hosted by the Ivey School of Business in partnership with the Haskayne School of Business. Our journey to the East began on a clear winter morning on the second of February. After ten hours of flight, we finally reached London, Ont. ?and were greeted by representatives from the Ivey School. Then, along with ten other business schools from across Canada, we were given a welcome speech by Gerard Seijts, the Executive Director for the Ian O Ihnatowycz Institute of Leadership. We were then split up into mixed teams of four with students from various business schools to compete in a case competition the next day. The evening ended at a local pub– Ceeps where we networked with students from across the country as well as their faculty coaches. The next day was eventful and exciting. Each of the mixed teams was given six hours to analyze a case about the Stratford Festival and prepare a sustainable business model. We quickly learned to work with other students by taking advantage of our diversity and realizing our individual strengths. We learnt some new case analysis tools from the other students and even exchanged valuable tips on slide decks and presentation skills. A wide range of recommendations were presented throughout the day by each of the teams and the day ended with a presentation given by the CEO of Stratford Festival herself where she told us about the decisions that she had taken at that point, where the company is today, and the vision of the company going forward. The final day of the case competition had us back in our home teams. With the same format as the day before, we were presented with a case wherein the city of Calgary must choose between two proposals for commercial development along the railway lines. The key issue was making a trade off between economic development and safety around the railway tracks. The teams were also given ten minutes with a representative from the city of Calgary to clarify any issues. At the end of the day the top two finalists were announced and were asked to present the cases again in front of all the teams and faculty from Ivey School’s Ian O Ihnatowycz Institute of leadership. Unfortunately, SFU was not placed among the top two teams. It was a great opportunity for us to see how the other teams approached the case and how we as a team could improve upon in the future. Saint Mary’s University was crowned first place with University of Victoria placing second in the competition. We are grateful to the Beedie School of Business for providing us with this opportunity and especially to Stephanie Reimer and Lesley McKay for providing us with help and resources to successfully represent SFU. We are grateful to the organizers of the competition. We are also excited for the connections we made with students from other schools as they helped make it an absolutely memorable and learning experience for all. Siddhartha Gupta is an MBA Candidate at the Beedie School of Business at Simon Fraser University. He completed his undergraduate studies in India at University of Petroleum and Energy Studies, receiving a Bachelor of Technology in Petroleum Engineering. He has management and technology experience across a diverse set of roles in the oil and gas industry. Siddhartha is passionate about client management, process improvement, team leadership, project management and community engagement. Find out more about Siddhartha through LinkedIn or contact him via e-mail.